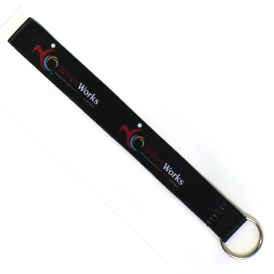 Fashionable key tags add color and style to your keys, bags, or zipper. Same art on both sides of tag. 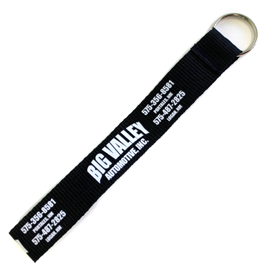 Standard size is 6" x 3/4"
Attachment LA-56 available on 1-1/4". Please call for pricing. Custom sizes and attachments for all items available. Please call for pricing. For additional thread colors, add .14 (C). 40.00 (G) plus set-up charge. Adds 2 weeks to delivery. 3 to 4 weeks from approval of artwork or pre-pro sample.